You have learnt about HIIT and also Hill workout. Today, It will be about Tempo run. As part of a "training regime" package, Tempo run is considered to be almost a mainstay in my weekly mileage. So, what is a "Tempo" run? Tempo is Italian for time. In the running lingo, it meant pace and speed. Likewise in music, the tempo of the music determine if the song/rhythm is slow or fast. But unlike music, a tempo run really meant running at a "comfortably hard" pace. Yes, an oxymoron - how can running hard be comfortable? It is like someone asking you for an exact estimate, or asking you to run in an irregular pattern. But it is what it is, a Tempo run. A run that is "paced" at almost your fastest pace. Fast runners (too many to name) will definitely have Tempo run in their training regime. Otherwise known to them as Lactate Threshold (LT) run. Long runs are good for a no-brainer endurance work, but a Tempo ensure you a sustained speed over the whole racing distance. Imagine you can run a whole marathon at the same speed from start to finish. A dream isn't it? Tempo run improves the single most important variable in a runner which is the metabolic fitness or how efficient your body will utilise the oxygen and fuel that arrive at the muscle at any given time during prolonged exercise. I have discussed this briefly in my Heart Rate Training entry and it has a comment section worthy of another blog entry. 85% and above - Lactic Threshold. 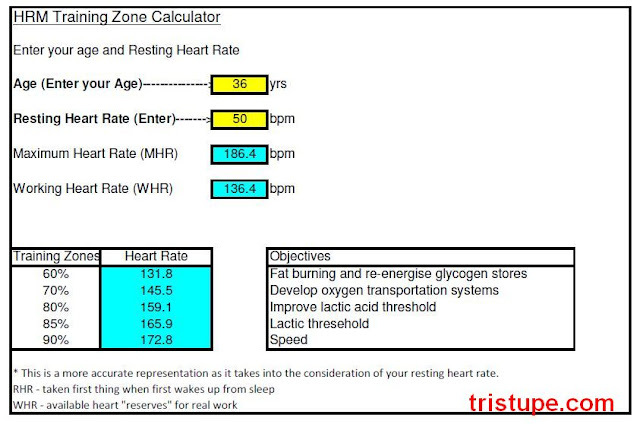 Lactate threshold, in laymen term is actually the stage where your muscle fatigue and you start asking yourself why are you putting yourself through this pain. (own up, you have asked more than once in all your long races, then suffer from selective amnesia and sign up for another one as soon as you finish the race). By training close to your LT with Tempo run, you will push the body to condition past the LT, elevating the "threshold" and your muscle continue to work (contracts) allowing you to run at the same pace, or faster and longer. Sounds good? But to do that, you will need to diligently (read : disciplined) to run at almost your fastest pace. Yes, almost your fastest pace. This is important to ensure a quality workout. Getting and striking the perfect pace for this Tempo run is never easy. I am sharing with you how I am doing it without getting too technical or relying on hi-tech gears. By getting yourself to the stage where your run become "comfortably hard", you felt you are really putting in the effort, but not all out. Here is a few ways to figure out what that would be. Take your fastest 5km or your 10km race pace (aka the one you just completed) and add on 30 seconds (to the 5km pace) or 10 seconds to your 10km race pace. Example, if you ran your best 5km in average 6:00 pace, do your Tempo in 6:30 or 6:10, respectively. I know it will sound funny if you talk to yourself, but that's what I do most of the time when I am running. Ask yourself (in your mind) what is your "pace". You should be able to answer (verbally), so that is what we are looking for. But if you ask yourself "What will be eaten for lunch later today" and you have to answer (verbally) a whole paragraph and can still do it, you are running too slow. Go faster. We in Good Tempo now? Great, now this is how you gonna do it. There is a few tempo variants, similar to Hill workout. But as this is an introduction to Tempo, lets stick to the Classic Tempo Run. A Classic Tempo involves three stages. You begin your workout with a 15 minutes warm up, then a 20 minutes Tempo and finish it off with a 15 minutes cool down. Sound easy enough isn't it? It can range from a short 6km run to a 12km run (all three stages inclusive, depending on your pace, obviously). The warm up tempo is where you concentrate to just run at a very easy comfy pace. You will cover anything between 2km to 3km depending on your abilities. Then you shift gear and start running at your Tempo pace. Aim to ensure that the pace is "comfortably hard" and do not at any point slow down more than you should. Maintain the pace or ease away another 10seconds (slower). You will cover anything between 3km to 5km, again dependent on your ability. The last portion is the Cool Down Tempo where you will ease up and run at the same pace as warm up or slower. What is important here is the "commitment to the time". Try as much as possible to ensure a 20 minutes Tempo with maximum amount of warm up and cool down to be 20minutes each. Distance is immaterial. Your commitment to the time is! I am a hands on person as most of you would know. This was my Tempo workout at close to race pace that was comfortable for me. I started with a Warm Up Tempo that covered 3km in 18minutes. Then I hit high gear and started running faster to the extend that I am considered to be in "the Tempo zone". I know I can run faster, but had to hold it off in case this become an all out effort. My 100% LT is when i run at slightly below sub 4:00 pace circa 3:50 for about 1minute. So, running at my 4:30 pace is close to my 80% LT pace which is what I am aiming for. Coincidentally, through experience, I know I am working at about my 90% effort. And coincidentally (i so repetitive , I scored my fastest 5km run to date. a 22:04. Ecstatic. That meant I can actually use this (pace) in future Tempo run to further improve on my 5km timing. Awesome. Once that was done, even with much reserves in the body, I have to start the Cool Down Tempo phase. Easy 3km run done in 17 minutes. All in all, it was a good 11km workout taking slightly less than 60 minutes. if you ask me, it was time well spent that will gear myself towards better improvement in both health and fitness. Why am I doing all these? It is to beat the biggest nemesis i ever have in life - myself. I benchmark my own achievement to myself because that is what really mattered. Put in the effort and don't forget to smile and reward yourself for a job well done. You owe yourself that much! This is the best explanation on tempo run I've ever read. Now I'm going to try it! Thanks for posting this!